A well brought-on young mare. Galina is ready to compete in show jumping tests for young horses at medium (1.30 m) level and is on her way to the advanced class. This mare has been placed several times in show jumping tests for young horses at medium (1.30 m) level, achieving scores of up to 8.5. She achieved many of her successes with a young girl. 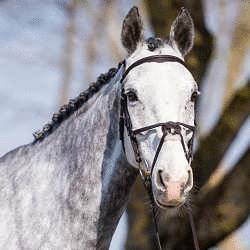 This well-behaved mare is easy to ride and has plenty of potential for high level show jumping. Galina is refined and has a competitive spirit. She is very kind and affectionate towards humans. 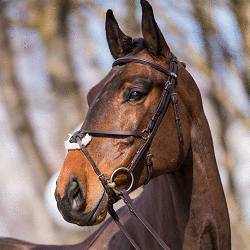 An ideal sport horse horse for any rider with competitive ambition and high goals. Refined show jumper with lots of ambition. A speed horse for ambitious amateurs. Several times nationally and internationally placed 1.35 m. Top junior horse. Show jumper for the immediate participation in 1.40 m. Winner in 1.35 m classes. Ideal for juniors, young riders or ladies for the high classes. Easy to ride horse, ready to participate in 1.35 m. International Youngster Tour is planed for 2019. Highly placed 1.30 m class ridden by a girl.